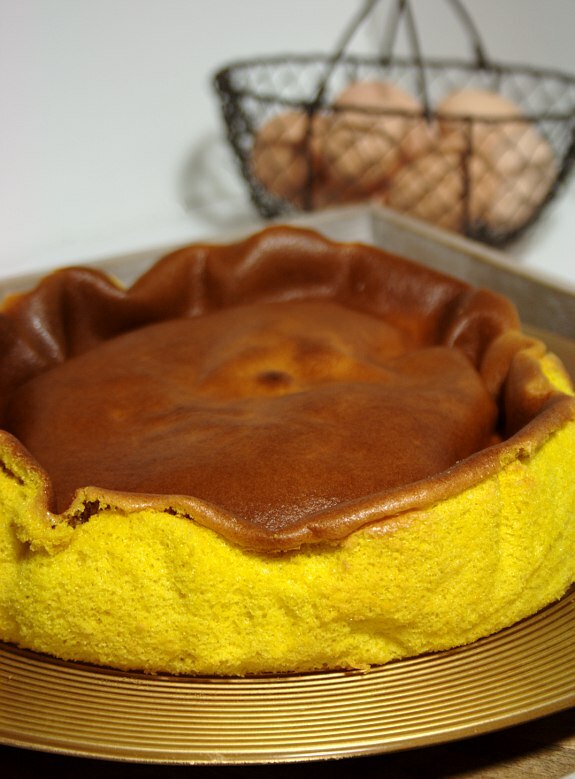 The first sponge cake with a kind of egg yolk based filling that I ate was from Rio Maior, where I spent part of my teenage years and where I still have many good friends. One could find it in almost every coffee and cake shop and gastronomically speaking it was - still is - an ex-libris of this small town. One of these weekends, coming from the West region and going to Santarém, I passed through Rio Maior, a land of salt but without sea, and I immediately remembered its delicious traditional sponge cake. Although I didn't find the original recipe, here it is my version. 1. Preheat oven to 230ºC. 2. Mix the eggs with the sugar in a mixer for 5 minutes. 3. Beat the egg yolks. Add them to the mixture prepared earlier and beat for more 3 minutes. 4. Sift the flour into the mixture and stir with a spoon or wire rod. 5. Put the mixture in a round shape cake tin with approx. 26 cm covered with parchment paper. This sponge cake is delicious. The core is completely wet. Its appearance sometimes is not very photogenic, but it is so yummy that one cannot stop eating it until the last slice.